Two geophysics students working in the field with Julie Bowles. 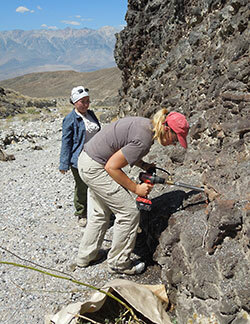 The Department of Geosciences offer several scholarships and awards to Geosciences students each year. Students are encouraged to apply for all scholarships that they qualify for using the online department-wide scholarship application. Most application deadlines are in spring (March & April) for the following school year (i.e. apply in March 2019 for scholarships paid in the 2019-20 school year). Scholarship recipients are announced at the annual recognition banquet held at the end of the spring semester. Our available scholarships and their criteria are listed below. Undergraduates and graduates students are urged to participate in the Annual Student Research Symposium by submitting an abstract and giving a brief presentation about the research projects they are currently working on. A call will be put out when materials may be submitted, but students will need to prepare a 300-word abstract which describes their research project, plus a 150-word introduction and biography, and a selfie for the program booklet. A faculty committee will review each submition and determine whether the student will give an oral presentation or a poster presentation. Best Graduate and Undergraduate Presentation Awards are given to the recipients of the highest scores received from a judging panel of department faculty. The recipient is honored at the Annual Student Recognition Banquet and receives a cash award of $100. 1. Be in good standing within the Department of Geosciences. 2. Be a student who intends to complete an MS or PhD degree in the Department of Geosciences within the next year (May, August, or December graduates acceptable). 3. Have submitted a thesis proposal, which has been accepted by the student’s thesis committee. 4. Have performed excellent research at UWM in the Department of Geosciences in partial fulfillment of MS or PhD degree. Applicants should complete the application form and request a recommendation letter from their research advisor (to be submitted directly to the Department). The recipient (or, rarely, multiple recipients) will be announced at the Annual Student Recognition Banquet. The Wisconsin Geological Society Research Grant was offered for the first time in 2013 and is being made available again through an account that the Wisconsin Geological Society has generously donated to our department. These funds are separate from the annual scholarship being offered by the WGS and are going to be awarded as a grant, rather than a scholarship. This money can therefore be used for field work, lab analyses/expenses, supplies, and/or any other expenses that are necessary to conduct your research as you work towards completing your graduate degree. All expenses charged to this award are subject to university policies and procedures regarding purchasing, travel, and reimbursements. This research grant will be offered at a maximum of $1,000 per recipient and must be spent on research costs that will occur between June 1, 2019 and May 31, 2020. Actual amounts awarded to each student are determined by the number of applications received, and those that qualify.